How do you help over 1,150 beginning farmers in New England in just a few short years? With over 60 partner organizations working together to improve land access for our region’s beginning and established farmers. And that’s just one piece of the pie, in one region of the country. Our Land Access Project is a multi-year, multi-phase project, that started in 2010 with a grant from the USDA/NIFA Beginning Farmer and Rancher Development Program. BFRDP is a Farm Bill authorized funding program to support the provision of direct support and education of beginning farmers across the country. In New England, as across the U.S., the average age of farmers is increasing. At the same time, aspiring and beginning farmers continue to face significant barriers to farming. To ensure the continued success of agriculture in the U.S., it is vital that we facilitate the transfer of skills, knowledge, and land between current and future generations. Since the Beginning Farm and Rancher Development Program was created (2008), nearly $150 million has been invested in new farmer training projects across the country. Over the past 18 months, a project led by the National Sustainable Agriculture Coalition (NSAC) has been evaluating the results of BFRDP grant funded projects. LFG is an NSAC member and LFG Executive Director, Jim Hafner, was one of the project’s Advisory Team members. The report’s release documents the impact of this program, the only federal program explicitly dedicated to training the next generation of farmers. Read the full report released from the National Sustainable Agriculture Coalition. Washington, DC, October 19, 2017 – Today, the National Sustainable Agriculture Coalition (NSAC) released findings from the first-ever comprehensive evaluation of the U.S. Department of Agriculture’s (USDA) Beginning Farmer and Rancher Development Program (BFRDP). 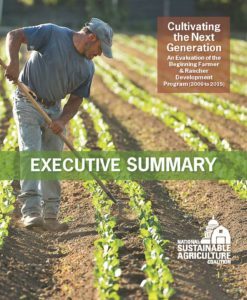 Their report, Cultivating the Next Generation, reveals the impact that this unique program – currently the only federal program explicitly dedicated to training the next generation of farmers – has had since it first received funding in the 2008 Farm Bill. The report also looks at the factors that lead to more successful new farmer training projects, and identifies areas in which BFRDP can be improved to better support the next generation. BFRDP has had many successes over the last decade. The program is helping to grow the next generation of farmers, building up agricultural infrastructure, and continues to innovate new ways to support entrepreneurship through farmer training projects. Since 2008, BFRDP has invested roughly $150 million in over 250 new farmer training projects across the country. The report finds that BFRDP funded projects are showing real outcomes – surveyed project leaders estimated that over half of their participants are now engaged in a farming career, and that nearly three-quarters of them felt more prepared for a successful career in agriculture following program completion. BFRDP has also helped nonprofit and community-based organizations, along with their academic partners, to build their capacity and serve more farmers with better services. The report also includes recommendations on opportunities for improvement in the program, including: continuing long-term investments in new farmer training and evaluation, deepening farmer engagement in program development, and improving the grant reporting process to ensure consistency in outcome data. The report’s two lead evaluators, Jan Perez from the University of California-Santa Cruz and consultant Ann Williams, have years of expertise evaluating beginning farmer training programs. This evaluation was also informed by an Advisory Team of beginning farmer practitioners and agricultural policy experts. Advisory Team members include: Center for Rural Affairs, CROPP Cooperatives, Land for Good, Land Stewardship Project, the National Young Farmers Coalition, and the University of California-Berkeley. This project was supported by the USDA-NIFA Beginning Farmer and Rancher Development Program (BFRDP).